The compact 4 is shown in it's reading stand, with a separate image of the reading stand also displayed. Designed for comfortable reading in High Definition! Enjoy a comfortable reading experience much like a dome magnifier. Use in combination with the detachable magnetic stand, and the Compact 4 HD is easy to grip, sliding effortlessly over letters, books, magazines and photographs. The unique portability and a special soft-touch coating makes the Compact 4 HD easy to use, comfortable to grip and stylish. When placed flat on a desk or reading materials, and used with the detachable stand, the screen of the Compact 4 HD sits at a comfortable viewing angle and can be used just like a dome magnifier. When out and about, take it off the detachable stand and carry in your pocket or handbag. 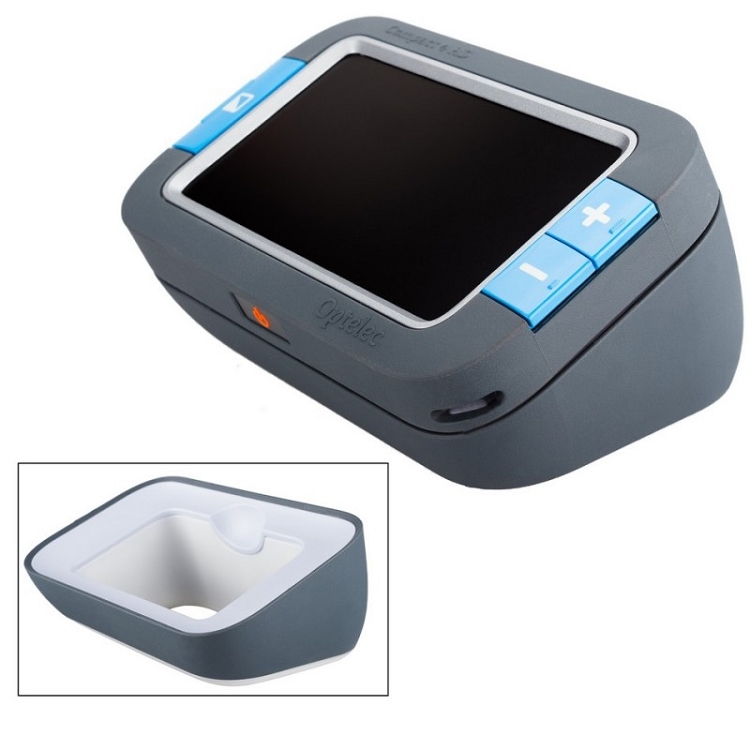 The Compact 4 HD becomes a pocket-sized, thin and lightweight magnifier for use on the go. Combining High Definition auto-focus camera technology, innovative lighting and a generous size 4.3-inch widescreen, the Compact 4 HD offers superior quality images. Using the high contrast colors and high brightness, text characters appear smoother while reading and images reaming steady. Adjust the display settings to meet your specific needs using the special large icon menu. The intuitive buttons are easy to control and allow you to change and save the preferred viewing modes, indicator sounds, level of brightness or the power options.